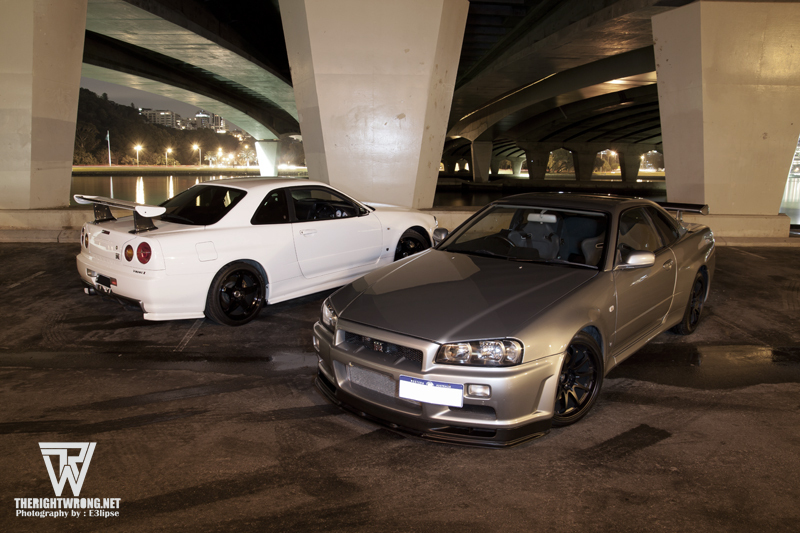 The all revered GTR and the last of the Skyline Godzillas. 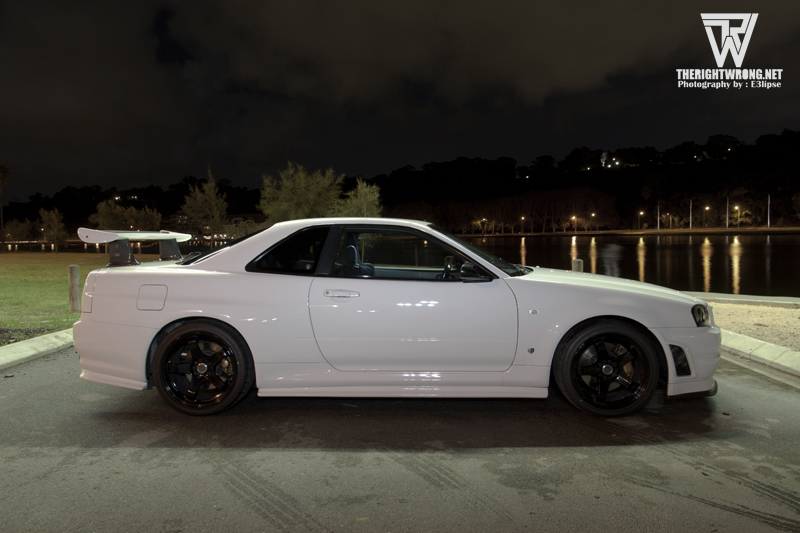 The Nissan Skyline R34 GTR needs no introduction. 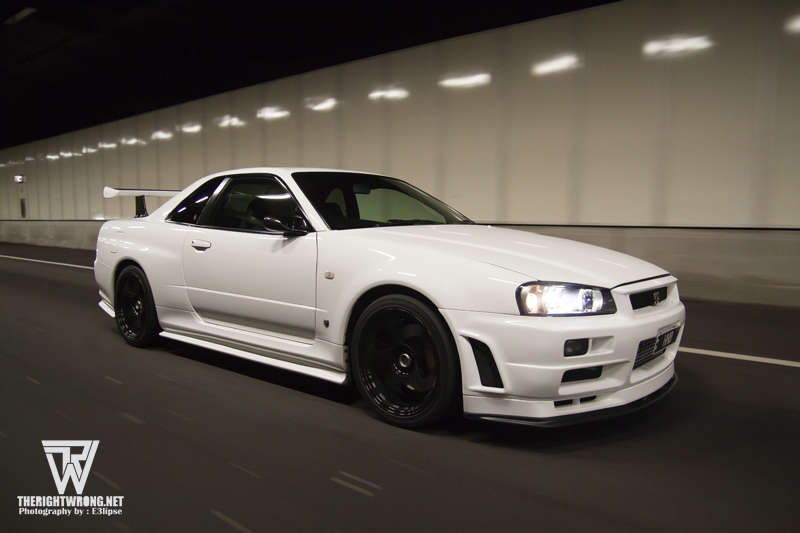 Powered by a RB26DETT (Nissan speak for a straight 6 2.6 litres dual overhead cam electronically fuel injected twin turbocharged) which is renowned for its great tuning potential. 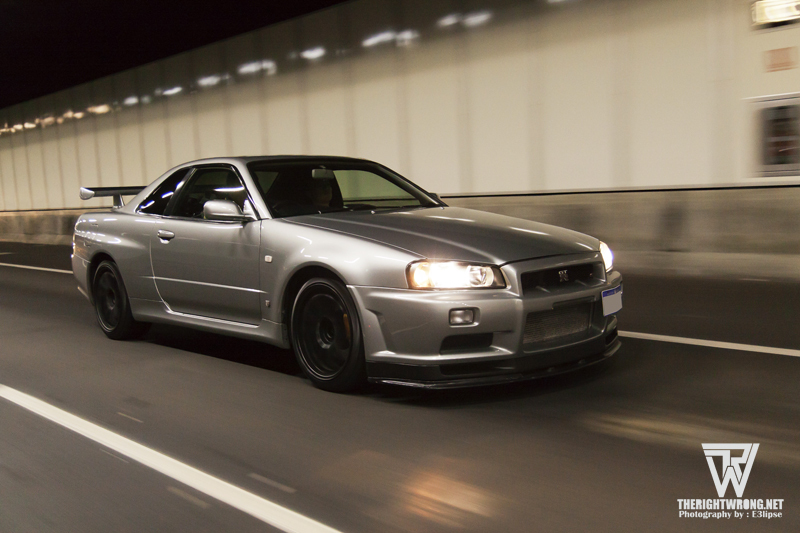 It’s always reported of GTRs smoking or keeping in pace with cars that are way more expensive that it is or being at the top of its direct competitors – the Toyota Supra 2JZ and the Mitsubishi GTO VR-4. 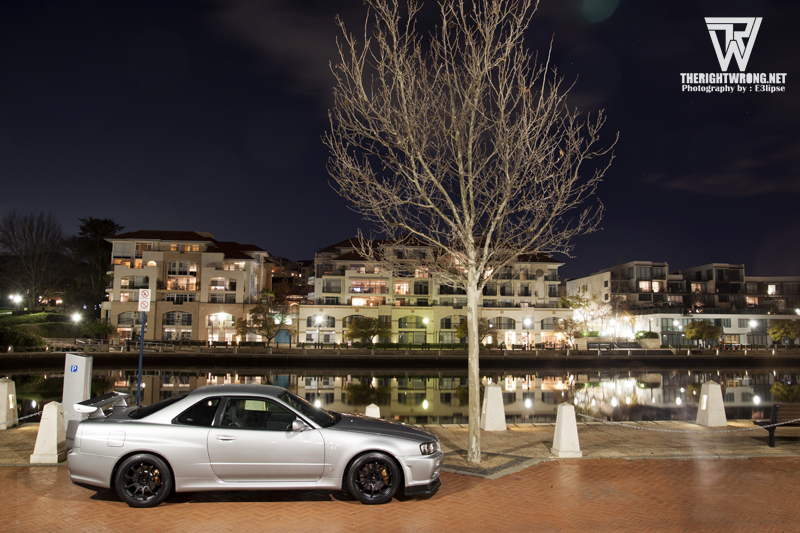 A powerhouse by nature, the Australian Touring Car Championships (ATCC) now known as V8 Supercars changed its rules to exclude the Skylines from competing after 1992 as it was dominating the race thanks to it’s ATTESA E-TS AWD system. I got to know Andrew earlier this year and the others whom I hung out with said his car was in the workshop and the built was about to be completed. Sure I’ve shot the Midnight Purple and Bayside Blue (which is my personal favourite), but I’ll always be excited to be close to a GTR. 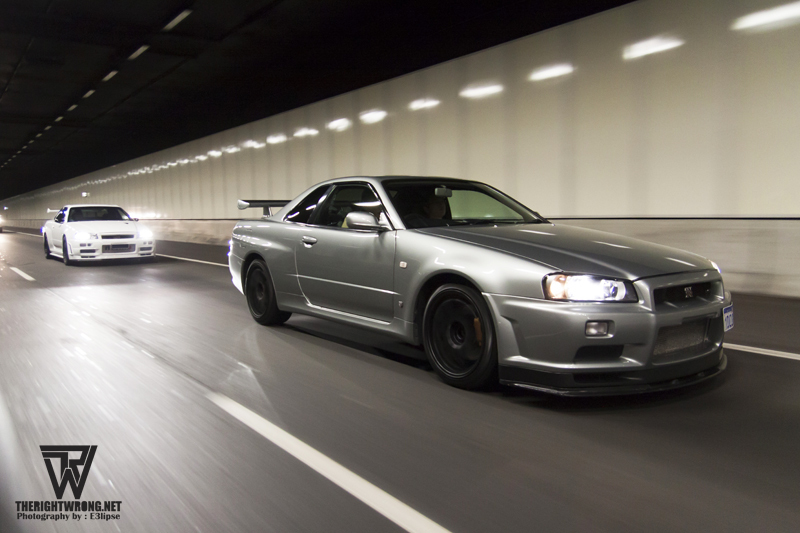 It’s probably due to the fact that they are exorbitantly priced in Singapore (no thanks to the COE system) and few remain on the road and my first encounter with a GTR would be… in Initial D Stage 4 (the anime). Andrew has future plans for the car in terms of aesthetics but that’s going to be a year away. Making an arrange with Heuson, they both agreed to a photoshoot. 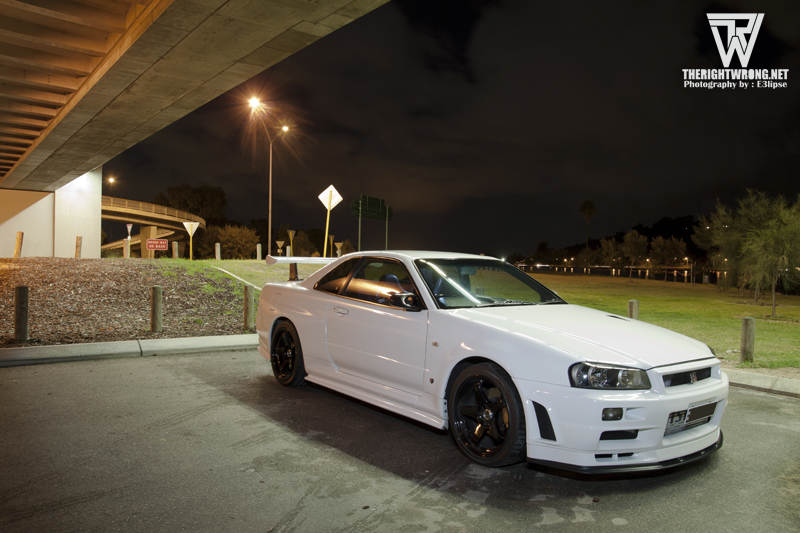 Heuson’s R34 GTR V-Spec II was sourced from the East as he couldn’t find the right Godzilla for sales in Western Australia, there are fine examples around but the owners were not selling them (I wouldn’t if I had one too). 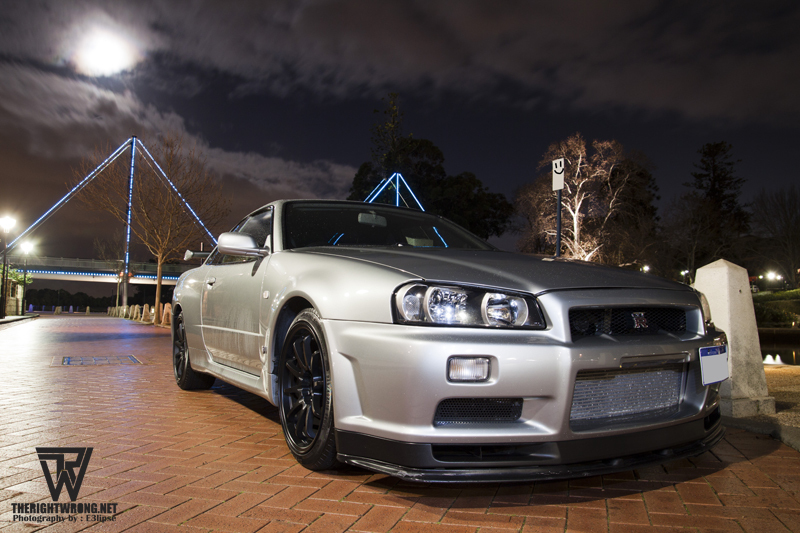 To put things in perspective, the R34 GTR is going for around $55,000AUD (which works to just under $70,000SGD) while the last time I checked, ONE Singapore registered R34 GTR was going for over $100,000SGD. This doesn’t seem like a lot but you can keep your car in Australia for as long as you like as long as you pay for your annual registration whereas you’ll have to renew your COE to extend your poor car’s life by another 10 years in Singapore. The that example I mentioned was already in the final year of its COE so essentially you’re forking out around $190,000SGD in total to drive it for the next 11 years. 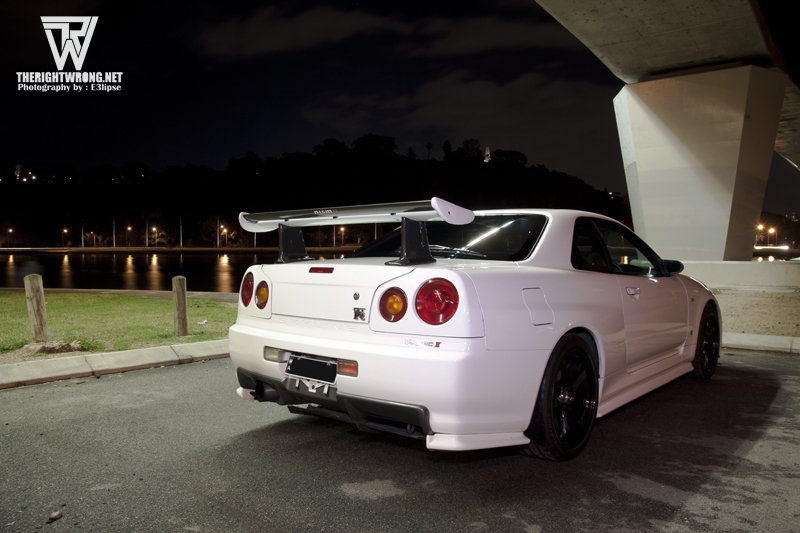 Back to the 2 GTRs, both are heavily modified and are not forces to be messed with. I won’t bore you down with more words, but I’ll bore you down with their specs and photos. N1 Cylinder Block, JUN Auto EX Custom 2.8L Stroker Kit, JUN Auto Full Counter, Billet Crankshaft, JUN Auto I-Beam Billet Conrods, JUN Auto Cosworth Forged Aluminium Pistons 87mm, JUN Auto Head Stud Bolt Kit, JUN Auto Crankshaft Main Bolt Kit Racing, JUN Auto Conrod Bearings, Nissan Tensioner Bearing, Nissan Idler Bearing, Nissan Tensioner Stud and Washer, Nissan Crankshaft Front Bolt and Waster, Nissan Flywheel Bolts, Nissan Clutch Release Bearing, Nissan Crank Pulley Spacers, Nissan Key Ways, HKS T51R KAI BB Kit, HKS Type R Intercooler, HKS Fuel Rail, HKS 1000cc Injectors X 6, HKS Fuel Pressure Regulator, HKS In-tank Fuel Pump, HKS Oil Pump (Upgraded Version), HKS Intake Manifold Gasket Kit, HKS Drag Metal Gasket Kit 1.2mm, Nismo Main Bearings, Nismo N1 Water Pump, Nismo Intake Plenum, Bosch 044 External Fuel Pump X 2, Sard Fuel Tank Collector, Earls S/Steel Braided Fuel Lines, Peterson 600 Series COT Fuel Filter, ATi Crank Damper Pulley Kit, Garage Ito Oil Catch Tank, Carbon Fibre Braided Breather Hose X 2, Mines Triple Flow Cam Cover Baffle Plates, Cusco Brake Master Cylinder, Koyo Aluminum Radiator, Garage Defend GT Cooling Panel Carbon Fibre, Hi Octane Oil Sump Extension, head System, HKS 280 Step 2 Camshafts In/Ex, Toda Racing Cam Gears In/Ex, Nismo Timing Belt, JUN Auto Cylinder Head Bolts, JUN Auto Cotterpins, JUN Auto Valve Spring Seats, JUN Auto Valve Lifter Set, JUN Auto Titanium Retainer Set Type 2, JUN Auto Valve Spring Set (High Lift), JUN Auto Big Valve Set, JUN Auto Valve Guide Set, JUN Auto Tappet Shims, HKS Front Pipe, Custom De-cat S/Steel, Trust PE II Ti-R 90mm Titanium Cat Back Exhaust.